The African bollworm, or referred to as Helicoverpa armigera as its scientific name of the insect order Lepidoptera (butterflies) and the family of Noctuidae or owlet moths is a major pest of soybeans and other crops. It is also hosted by field bean, cotton, maize, peas, peppers, sorghum and tomato plants. This bollworm occurs in every African country and on other continents. A high infestation in a soybean land can have devastating effects on a perfectly planted crop. The damage occurring in any season will depend on the planting dates and the early flight patterns and time of the first moth flights. Farmers should be on the lookout for any damage after ten days from planting in any particular block and keep in mind that the onset of an infestation will differ from year to year. Caterpillars feed on leaves, buds, growing points, flowers and fruit. It can thus occur in the vegetative or plant growth stage as well as at the flowering and fruiting or seed set stages. 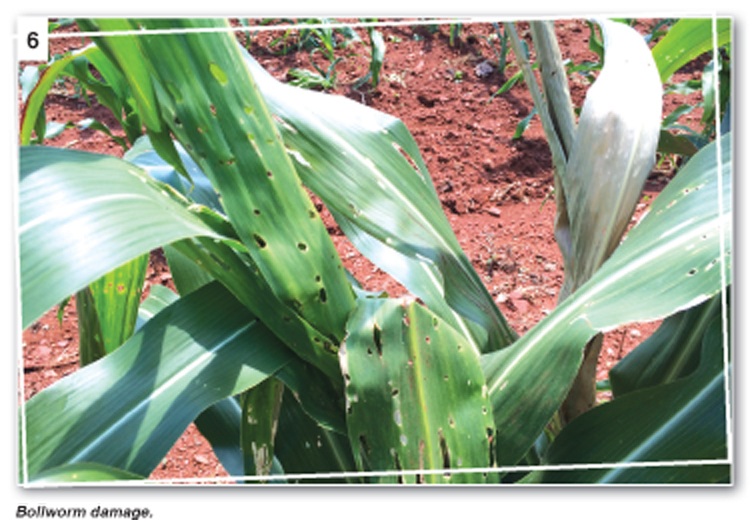 The resulting leaf damage reduces the leaf area that can photosynthesise plant nutrients and can result in high losses of grain production if not controlled. The small worms bore clean circular holes through leaves and pods. The waste droppings are placed away from the damaged plant components and can be difficult to see on or under the plant. Once they burrow deep into the pods they are difficult to control by insecticides. The adult moth is a fleshy, yellowish brown with a dark speck, greyish irregular lines and a black kidney-shaped mark on the forewings (Photo 1 and 2). The hind wings are whitish with a black patch along the outer margin. The moths are about 14 mm to 18 mm long with a wingspan of 35 mm to 40 mm. The moths which are relatively strong fliers are widely dispersed in the growing areas and can also be carried by strong winds into new areas were soybeans are grown. The moths are strongly attracted to plants that make honeydew or nectar in the flowers. The moths lay large number of eggs and the life cycle may be completed in a short time under warm conditions. Eggs hatch in three to five days. 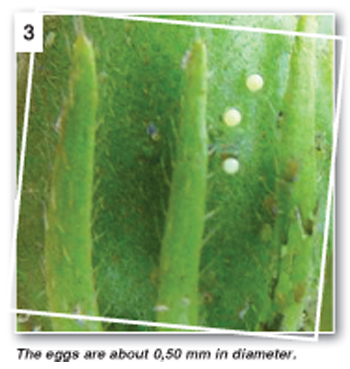 The eggs are tiny being about 0,50 mm in diameter, round and yellowish-white in colour (Photo 3). They darken before hatching as the larva grows inside the egg. 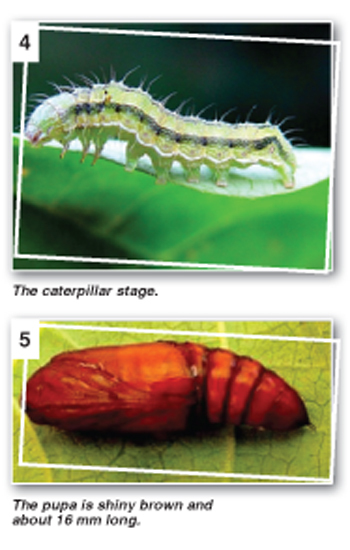 The larval stage which includes the caterpillar stage (Photo 4), lasts from 17 days to 35 days. Young caterpillars are generally yellowish white to reddish brown. They have a dark brown head and several rows of black bumps with short hairs along their backs which gives them a spotted appearance. Older caterpillars vary in colour from almost black, brown or green to pale yellow with dark grey yellow stripes along the sides of the body. The fully grown caterpillars drop from the plant and burrow into the soil to start the pupation phase. 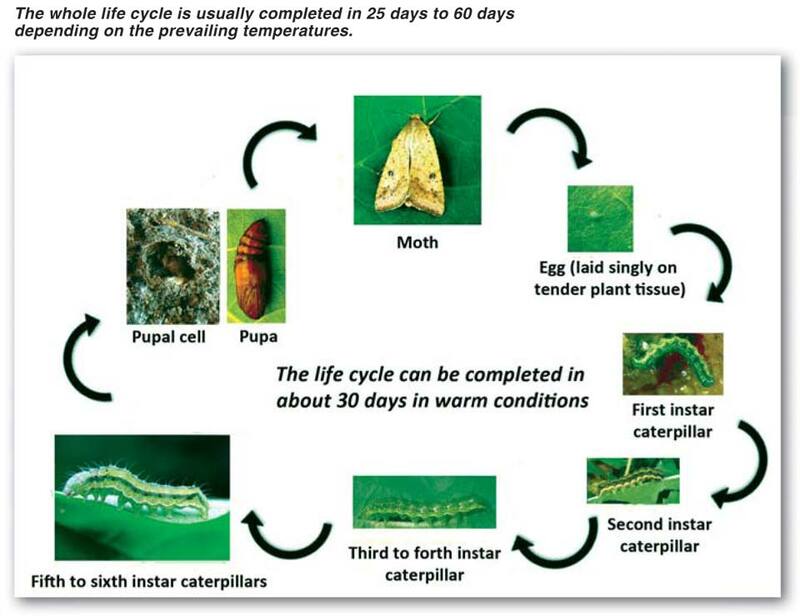 The pupal stage, in the soil, lasts for between 17 days and 20 days. The pupa is shiny brown, about 16 mm long, with a smooth surface with two short parallel spines at the posterior tip (Photo 5). The whole life cycle is usually completed in 25 days to 60 days depending on the prevailing temperatures. The moths then emerge from the pupae and fly to start another life cycle in the season. The bollworm caterpillars can be controlled naturally by various wasp predators and fungus infections. The deseased larva can be observed in the plant canopy which can have an ecologically balanced micro climate in ideal conditions . It is however quite rare that chemical control will not be required and can be the most effective way of properly controlling the problem. It is extremy important to walk through your lands to look for the moths, They can be observed by disturbing the plants during the day as they fly off. Farmers can see the woven cucoons, within the leaf canopy, that are spun by the mature catepillars. The curled up leaf with the spun cocoon can be easily observed. This can be at a very late stage of infection however. Control measures should have already been implemented! Soybean plants can withstand up to 35% foliage loss up to the blooming period. This can be measured by collecting a representative number of leaves from plants at random and assessing the percentage damage on each leaf. The total average damage at any one stage can then be calculated. However, during blooming and during pod fill even 20% leaf damage will result in a yield loss. As a guideline 25 or more larva of 12 mm in length per metre of row will cause a 35% average defoliation. It is generally accepted that chemical control by spraying will be commercialy viable when this level of damage is experienced. The problem is that damage escalates rapidily from 20% to 35%. It seems prudent to immediately initiate spraying at the 20% leaf damage stage or when 25 larva or more can be can be found per metre of row. It is being found worldwide that the use of pyrethroid insecticides has become ineffective with a control of three out ten applications being effective. The use of pythrethroids alone, in the Free State during the last few seasons, as the only chemical control measure produced very poor results. The recommended control measures are to spray a combination of pyrethroid and diamide based insectcides. A possible effective combination would be a pyrethroid such as lambda cyhalothrin (Kartae) at 50 g/ha together with methomyl applied at 100 ml/ha in a mix of between 300 litres/ha and 500 litres/ha. Using water volumes below this simply won’t cover the leaf and stalk to achieve good results. It is very important to spray at a pressure of between 2,5 to 3 bars to ensure that leaves are shaken enough by the spray to expose the caterpillars protected within the leaves. It is virtually impossible to control them when they have penetrated the pods. It is well worth doing as an insurance against any further escaltion of damage exceeding 20% leaf damage. Rememeber that it is important to include a sticker such as orosorb to ensure that the chemicals attach to the plant leaves and in turn have the best chance of killing the worm larvae. The mixed spray will have a residual effect of about three weeks to be able to control any infestations within this period. Always consult your chemical supplier or consultant for the best practical advice and to check that the recommended mixture is best suited to the stage of soybeans being sprayed. It is really critical that the farmer scouts for moths and caterpillars in an intensive and regular manner in order to be able to detect and control a potentail dangerous infestation of bollworm as early as possible.